This Star Wars laundry hamper is shaped like R2-D2 and a much better place for dirty laundry then the floor. 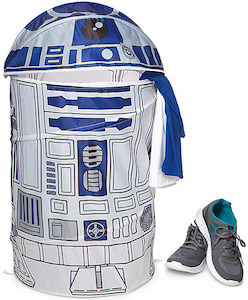 If you are a Star Wars fan with a floor covered in dirty clothes then you need this R2-D2 laundry basket to help you out. The foldable Star Wars hamper is white and blue and round just like R2-D2 and it even has a dome top to make it looks even more then the famous Star Wars droid. Just find R2 a nice spot in your room and you are ready to find the floor of you room again. How do you get your child to put the dirty laundry in the basket instead of the floor? If they like Peppa Pig then that is easy. You just need this special Peppa Pig laundry basket. 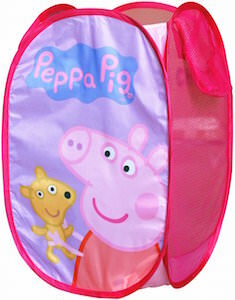 The foldable laundry hamper is fun and colorful and of course has a picture of Peppa Pig and her teddy bear. The pop up hamper also has the “Peppa Pig” name printed on it. A hamper like this is great for laundry but also works great for plush toys or other stuff lying around. Peppa loves to help you get organized and a hamper like this can help. If you are looking for a smart piece of decor to keep all your things in check, don’t look any further because this will be all you need! 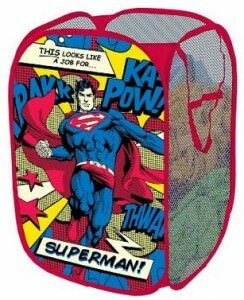 The DC Comics Superman pop up type hamper is three sides mesh and one side with amazing graphics. Superman is flying through the air ready to strike with his bulging muscles all over the place in true, bright colors. Ka-Pow and Thwak will be all you hear when it “Looks like a job for….Superman”. The size of the mesh hamper is 21.5″ high by 13.5″ wide by 13.5″ deep, which means it can fit in the smallest of places and still make a big impact by holding your dirty laundry, books, stuffed animals or what ever you want. Something you can always count on, the Superman Mesh Hamper. Do you need an easy way to store dirty clothes, or maybe a stuffed animal storage basket? This pop up hamper is the solution! 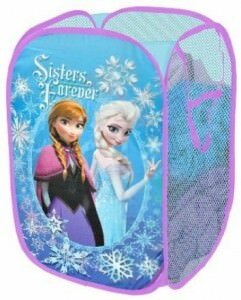 Featured on the front side of this laundry hamper is two very popular Disney sisters from the awesome animated movie Frozen. Find Elsa the Snow Queen of Arendelle and her sister Princess Anna of Arendelle both in vibrant color with an array of snowflakes surrounding them aswell as the saying “Sisters Forever”. This is a pop up laundry hamper that easily folds down to store, it is perfect for tight spaces and with the handles it is very simple to carry to the laundry room, it is also durable with a steel wire frame and mesh sides. 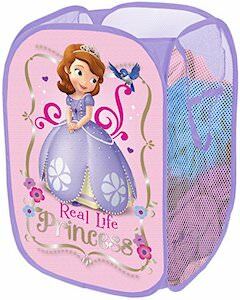 Complete any room with the Disney’s Frozen Elsa And Anna Sisters Forever Laundry Hamper. Kids love Winnie the Pooh even babies love the cuddly bear that loves honey. So why not give them a laundry hamper that they will love to. This hamper is folable and still really strong and on the ouside you find Winnie the Pooh and his friend Piglet and of course some honey and bees . Click on the picture and see what other think about this laundry hamper. And beside being a super laundry hamper you could of course store toys in it to. Winnie the Pooh does not mind other bears to be stored in his hamper. 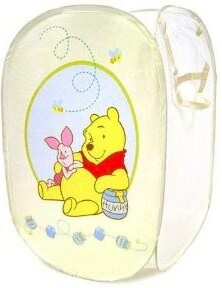 Don’t hesitate this is the hamper you want, come get your Winnie The Pooh Laundry Hamper. Toys and laundry is always piling up somewhere and how to we deal with that? Maybe a nice hamper will solve that problem. If you kids like Toy Story then you may want to look at this Toy Story Hamper. 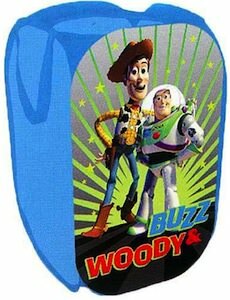 With a picture of Buzz Lightyear and Woody this hamper could be fun for you kids and maybe they will even start putting there stuff away themselves just to play with Buzz and Woody. Hello Kitty loves carnavals and as you can see the balloons take her all the way up in the sky and in the back you can still see the carnival rides. But lets talk a little bit more about this Hello Kitty product. This is a laundry hamper that can store tons of dirty laundry and still look great. 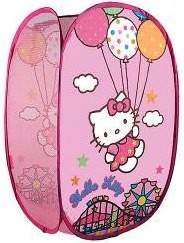 Pink is the main color of this hamper and it is all decorated in the typical Hello Kitty style. Kids will be loving this hamper and if you are in luck they will even put their dirty laundry inside. Time to sort out the laundry with this Hello Kitty Laundry Hamper.